Usually, you’re spending a pretty penny at the DMV to begin with, so be sure to pay attention to signs in the parking lot when you arrive; some spaces (and even entire lots!) are reserved for employees only. The last thing we want is for you to be stuck paying more money than you have to all because of an easily avoidable parking ticket! I stopped in at about nine o’clock on a Friday and the place was barren for a DMV… I wouldn’t have even been surprised if a tumbleweed happened to roll by. It may have been a stroke of luck but I’d say an early Friday morning visit is your best bet, if possible. You can also figure out which days of the week and times of each day are best to go (or avoid!) 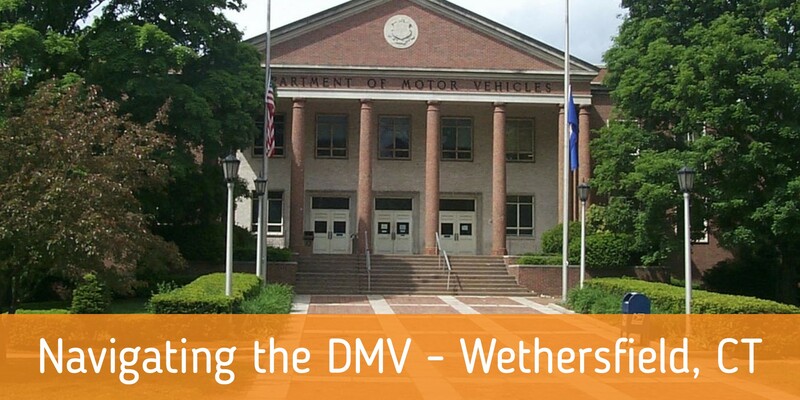 with a simple search of “Wethersfield DMV” … Click → here ← ! At first glance, it’s not too large compared to the other offices but there’s another, almost hidden, section of the room. That section is where you’ll head towards if you’re testing for your license; line five, to be exact. Like I said before, if you’re there for this reason, there’s no need for a transaction ticket. Just be sure you have all needed ID’s, forms, & paperwork. This is one of the CT DMVs that has popular visiting times available online; do yourself a favor and check it out while planning your own visit. Be sure you’re parked in a space you’re allowed to stay in before heading inside! Leave with more than enough time to safely make it to your DMV appointment. Gather all needed identification, forms, & paperwork the night before so there’s no worries of frantic searching in the morning; you’ll thank yourself! Need help getting your permit? Download our FREE Permit Prep eBook to find out everything you need to know!